Here's how to watch the 2019 Met Gala in Australia. How to watch the 2019 Met Gala in Australia, and what to expect from fashion's biggest night. The Met Gala is lauded as fashion’s biggest night, bringing together designers, models, movie stars and musicians (plus a few reality TV stars) for one night of glorious themed fashion in New York. 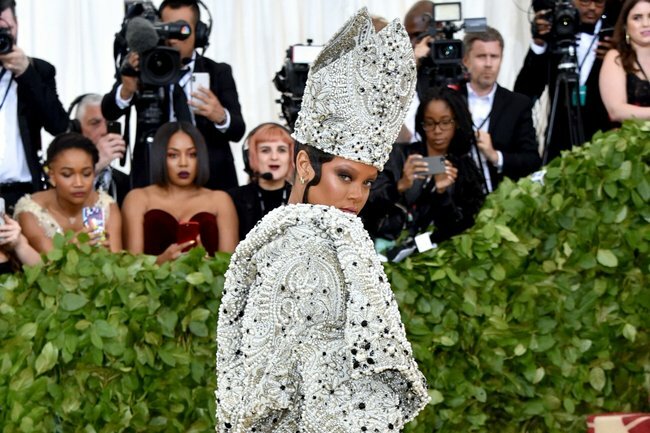 They come dressed according to a theme that often allow some pretty interesting red carpet looks – who can forget Pope Rihanna on last year’s carpet? This year’s red carpet is just around the corner. Here’s everything you need to know about the Met Gala. When is the 2019 Met Gala? The Met Gala is always held on the first Monday in May, so this year’s event takes place on Monday, May 6, beginning at 7pm local time. For those of us down under, this mean’s we’ll be seeing the red carpet taking place on the morning of May 7 – between 9am and midday AEST. Mark it in your diaries. How can I watch the 2019 Met Gala in Australia? The actual Met Gala isn’t televised, but in the past E! Australia has live streamed the red carpet. It’s also streamed on the Vogue US website, as Vogue hosts the event. Of course, you can count on Mamamia to keep you up to date with all the red carpet looks and goss throughout the day. Who will attend the 2019 Met Gala? While you can expect plenty of celebrities to grace the red carpet, Lady Gaga, Serena Williams and Harry Styles will definitely be in attendance as the trio are co-chairing the event. Blake Lively at 2018&apos;s Met Gala. Image: Getty. Met Gala regulars like Rihanna, Kim Kardashian, Blake Lively are also highly likely attendees. What is the 2019 Met Gala theme? For 2019, the Met Gala theme is Camp: Notes on Fashion, inspired by a 1964 poem by Susan Sontag. To give you an idea of what we might see, the museum&apos;s accompanying exhibition will include looks from Moschino&apos;s Jeremy Scott, those viral meme dresses from Viktor&Rolf and Bjork&apos;s famous swan dress. Exhibition curator Andrew Bolton told Vogue he anticipated the outfits "will be more playful, extravagant and adventurous. I&apos;m hoping for more Cher-like Bob Mackie moments or Bjork-laying-an-egg moments." With four weeks left till the Met Gala, celebrities and designers will be working tirelessly to create fashion moments we&apos;ll all be talking about come May. We wish them luck.